back to the garden... flower power comes full circle: Spokane Earth Day Screening: sold out show, 3rd added by popular demand. Spokane Earth Day Screening: sold out show, 3rd added by popular demand. celebration...Great bunch of folks who were 2/3rds twenty-somethings and the rest baby boomers who remember it well...Music provided by Harvey Swanson and Deb Vester. Then came Earth day in Spokane, Washington...the real capitol and service city to the communities of Back to the landers who are part of our film...They don't drive to Seattle to get supplies they can't get in Wennatchee, they drive to Spokane. Having an opportunity to bring our story of Eastern Washington's counterculture to the heart of Eastern WA. presented a rare opportunity. Luckily the gods of film screenings were smiling as we were joined by two of our main characters, Skeeter and Maeyowa for the post screening Q & A.
audiences were spellbound. They loved the film but they loved our remarkable characters too. Each of us really felt the genuine love and support expressed by Spokane's audiences. We had a magical time in Spokane! I can't wait to come back again. 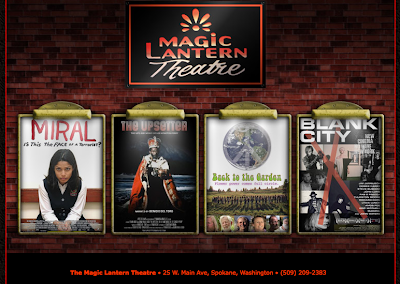 Thanks so much to the Magic Lantern Theater, the Inlander and Spokane Public Radio for helping us spread the word about our film! It just keeps on rollin'! photos below: Our Earth Day road trip from the Methow Valley to Spokane took about 4 hours...we broke it up by stopping at the often missed viewpoint just above the Grand Coulee Dam...photos of Judy Kaplan (co-producer) with Maeyowa sharing lunch at this amazing picnic spot.